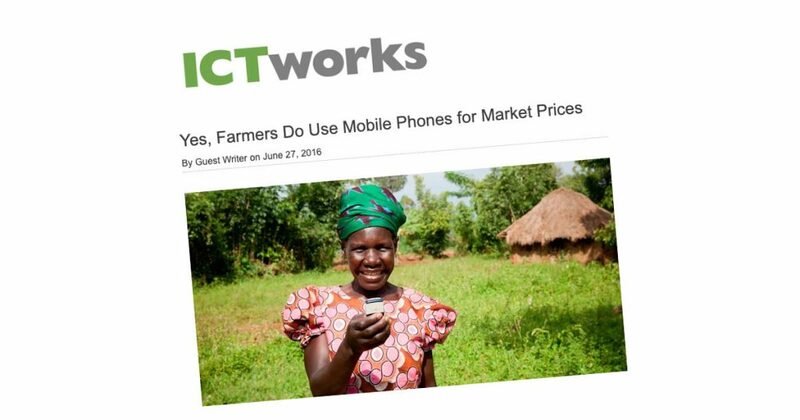 Farmers in Malawi had free access to market prices via mobile phones for about three months using HNI’s 3‑2‑1 Service. Usage data was rolling in. And along come two posts on ICT Works that are highly critical of the whole idea that farmers and fishermen can actually benefit from market prices provided by mobile phones. A superficial skim of these posts might lead you to conclude that “Mobile phones are not used for market prices,” or that, “Mobile phones are social tools not information delivery platforms.” But a closer read reveals something more nuanced than that. Each of these articles summarizes the findings of two of recent research reports on ICT4D. Reading through the two articles we realized that, actually, they were right on many counts. The projects referred to in the reports did have shortcomings. And the projects had the same common denominator: SMS. The users of SMS-based systems need to be comfortable sending and receiving SMS messages, obviously. And the phones at the disposal of the farmers and fishermen are often banged-up old phones with cracked screens and keys with the numbers and letters worn off. The market price system HNI has implemented in Malawi does not rely on SMS. Instead, it is based on Interactive Voice Response (IVR). As long as the phone can perform its basic function — to make and receive calls — the IVR system should work. The price information is all in voice recordings, recorded by native Chichewa-speaking professional voice talent. If the caller can follow the voice prompts (such as “Press 1 for Market Prices in Blantyre”) he or she can be listening to market prices in as few as three keystrokes. Farmers are not held back by their literacy level, spelling skills, or issues with text entry. Nearly 36,000 people have accessed these market prices since the service was launched in March of this year. The raw data showed that when people called to hear the prices for particular markets, there was strong tendency to listen to the entire message. That’s called a “completion” in our metrics. About 16 percent of callers hung up without choosing either the urban or the rural market prices. The service does not have price information on every market in Malawi, so some of these hang-ups probably represent people who don’t live near any of the featured markets. This usage data only proves that people are using the service, and listening all the way to the end. But are they using the information? Does it have any impact on farmers’ lives? We decided to call back some farmers who frequently have accessed the service to find out what impact this market information has had on their market strategies and on their incomes. Our sample size was small — only 14 farmers. We won’t make any broad conclusions from this informal, unscientific exercise (which was a criticism of the Fisherman study). But what we did find was — anecdotally — pretty encouraging. Emmanuel Chilembwe, a 37-year-old farmer in Malawi’s Mangochi district, sells pigeon peas, corn, cowpeas, tomatoes, and other vegetables to middlemen. He told us that he is using the system to keep the middlemen honest. We live far from the markets. Vendors come and buy from us,” Chilembwe said. “We are now able to sell at good prices because we charge in accordance with what we have heard on the service. Chilembwe checks the prices about five times per month using a simple mobile phone, and says that his income has increased since he began using the service. Of our sample, six farmers reported that their income has increased, four said there had been no change, another four said their income has decreased. Rajab Mdala, 22, a farmer in Blantyre, was able to cut out the middleman once he became aware of the prices at the Ace market for corn, groundnuts, sweet potato, and cassava. 3‑2‑1 has helped me in making profits by selling my farm produce at Ace,” said Mdala, “rather than selling to vendors who buy at lower prices. Six farmers said that they have changed where they sell their produce as a result of using the service — some more than once. And none of these farmers reported a decrease in income. The four farmers who reported that their income had decreased said that they had not changed where they sell their produce. The distances from where they live and the logistics of transport removed any cost benefit of potentially selling in these alternative markets. Simply knowing the prices in an alternative market does not mean a farmer can just show up and start selling. This was another criticism of the overreaching claims made in the study of the South Indian Fisheries Sector. Echoing that critique was Maguya Benson, 26, a farmer in Mchinji district. “The market prices say nothing about the procedures one would take to make the sales.” Other farmers asked for prices for more crops, and for pricing from more markets. The service has only been live for three months, but our provisional takeaway is that we are doing a few things right.